The best tattoo grips will make your life as a tattoo artist much easier. We don’t often think about how well we can grip the machine when laying ink. If you think about it, though, it’s likely that you’ve delivered some of your best work with a high-quality grip. Just How important is My Tube Grip? Should I Go With Disposable Tubes? These hefty and brightly-colored metallic grips are made from aluminum and weigh less than they look. The lightweight feel, large grip area, and choice of colors give the tattoo artist the flexibility they need in their line of work. 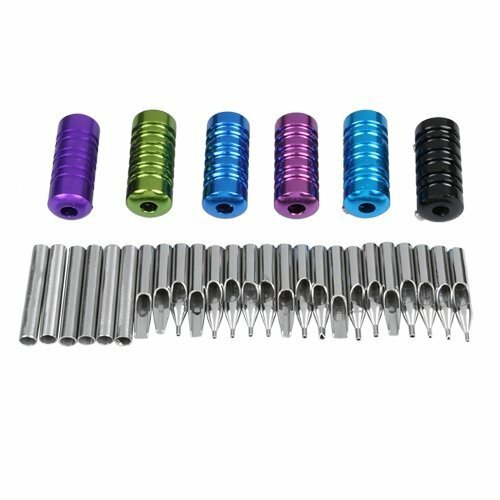 These aluminum grips come in a set of eight, each a different color. 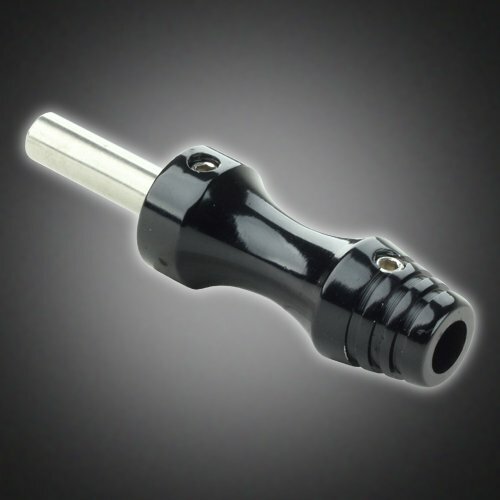 For those who are fortunate enough to have their own autoclave tattoo machine, these grips will make your machine stand out and give you something that you can hold onto firmly. The back stem is detachable from the grip with two screws, giving the user easy access for sterilization. These disposable tips come with the tube and grip all packaged into a single unit. These tips are sold in packs of 50 and would be an ​excellent option for someone who doesn’t have access to an autoclave unit. All the standard tip sizes are included in each box. The rubber grips add a firm, comfortable feel to the tube. 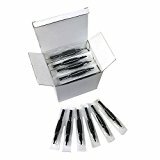 This allows the user to grip the slim tube more accurately to ensure top-notch body art. Even though these tips are disposable, the look and feel that they ​have gives them a more professional look that both the artist and client can rely on. 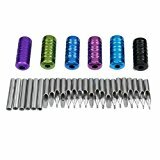 This Tattoo tube and tips combo is a great deal for anyone just starting out as a tattoo artist. This 31-piece kit includes 19 stainless steel tips, six tubes, and six grips. I personally think that this is one of the best tattoo grips combination packs available, regardless of your level of experience. The metallic grips themselves have a sensible grip pattern for holding onto and each come in a different color. The customizability of this set provides backup equipment if you need to dispose of a tube or grip. While this is a great product kit for someone just starting out their career in body art, keep in mind that the tips and tubes are reusable and need to be sterilized between uses. It might also be wise to keep an extra set of tips, as most of the ones included come as singles. These disposable grips are great for those using any type of tattoo machine setup. These come in boxes of 25 and provide convenience and comfort to the tattoo artist. Not only can you ​offer your services without scarifying your comfort, but you don’t even have to worry about sanitizing the grip. While this grip doesn’t pose an immediate health risk straight out of the box, it’s important to be mindful if you’re using Gorilla Grips with reusable needles and tubes. However, these work just as well with disposable setups also. For those who don’t have tube and tip setups with a grip around the tube, this box of disposable grips might serve as a long-lasting option for comfortable machine grip options. 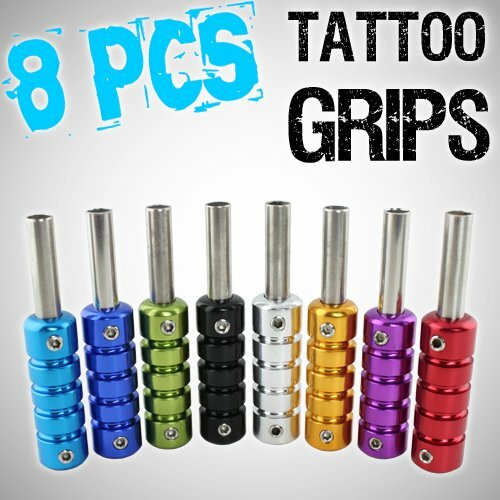 These are very cost-efficient tattoo grips for their quality. The sleek black aluminum is narrowly shaped to allow the user to grip it in virtually any way that could suit them. The hourglass shape of the grip itself also allows the tattoo artist to readjust the angle of their machine as needed. The unique shape and simplistic design of the grip’s paint job will give any tattoo machine a glossy, professional look. This lets clients know how serious you are about your trade. 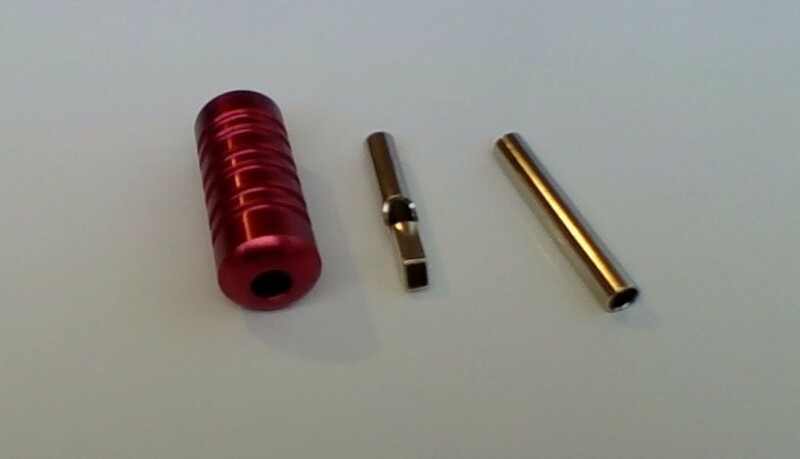 The aluminum stem and casing of this grip make it reusable between sterilizations. This grip would be ideal for someone who has a set of reusable tips and likes flexibility in positioning their tattoo machine. Anyone who appreciates precision in their work would benefit greatly from the GoHobby ultra slim grip. The grip is the part of the tattooing tube that an artist hold on to while they're painting their design. Without this little part, you would have no way of keeping a steady grip on the machine. Anyone who has so much as attempted to give a tattoo knows that accuracy and a firm grip are crucial for quality work. As with any precision-based task, being able to comfortably and accurately maneuver a tattoo machine are vital skills in delivering the most attractive ink. Even though it’s a relatively minor part in all the tattoo equipment, it allows the artist to create their work while using the rest of their materials efficiently. Since the tube grip is a small part, it is one which is usually universal. As an artist, you'll need to be mindful of the sizes of your needles that you'll be using for your projects. When you change out your needles, you will need to make sure that your tube sizes correspond accordingly. As in almost every aspect of life, size does, in fact, matter when it comes tattoo tubes. If you put a 3RS shader into an 18 round tube, you won’t be able to lay ink properly. If anything, the needle will probably fall out before you even get the chance to begin painting. The importance of size doesn’t mean that thick needles are what you should always use. Whether you are an experienced or an aspiring tattoo artist, there’s a good chance that you already know this. How fine your lines need to be will determine what type of tube you’ll be using. The size of your tube will almost always determine the size of the grip. This isn't something that should be taken into consideration since grips are built into the tubes. This pertains specifically to reusable metal tubes. Even if you have a hard time remembering exactly what tubes certain needles fit into, don’t worry. This chart for tubes and corresponding needle sizes will make it easier for you to remember what you need to use and when. If you’re using disposable equipment, the grip you use probably won’t have a designated size. Most disposable grips come in a universal size that can be fitted around any tube. While these are usually cheaper in the short-term, the need to keep buying them will result in higher costs later over time. This is a tough question to address with just a simple "yes" or "no." The need for disposable or reusable grips will depend on what type of equipment suits you best. As I said before, the difference in costs is only temporary if you choose the disposable method as your main source of tattoo art products. Personally, I use disposable grips. The nice thing about disposable grips is that they can be used on non-disposable tubes if they fit well enough. Autoclave and disposable tattoo systems appeal to different artists. Depending on your budget, level of skill, and personal preferences, you may find that autoclave and disposable equipment have their individual pros and cons. Even though some grips might look super cool, it usually takes a talented and experienced tattoo artist to deliver high-quality work without an easy-to-hold tattoo grip. The best tattoo grips will offer comfortability for the person holding it while fitting around the tube snugly. The reason I like disposable grips aside from their ease of use and maintenance is that they are usually the most comfortable to hold onto. Disposable grips that can fit around most tubes are often made from a soft mesh-like material that makes it easier to fit around the tube. The padded feeling of disposable grips is what makes them so comfortable to hold onto. Since they aren't made from stainless steel or any other type of standard metal, it's easier to keep the machine from slipping out of your hand. Another nice part of disposable tattoo tubes is that there is no need to sterilize them after each use. If you decide that reusable equipment is your way to go, be prepared to invest a little more. Comfort is essential for any task that requires precision and concentration. After all, it’s hard to stay focused when your hand is not in the most ergonomic position. Although it’s highly unlikely that you’ll get carpal tunnel from an uncomfortable grip, your quality of work might suffer. No one likes to think of their work quality as less than satisfactory, especially if it is due to preventable measures. Being able to focus on maintaining a firm, steady grip on the tube of your machine is a pretty mundane task compared to the other factors of tattoo art that require adequate attention. The best tattoo grips will make it easier for you to hold and guide the entire tattoo machine with the right techniques. If you have limited experience as a tattoo artist, don’t attribute your mistakes solely to your grip. Just keep practicing and finding out which positions work best for you. Your machine holding and painting techniques will help ensure that your tattoos are possible without any medical complications. No matter how talented of a tattoo artist you might be, though, you need to make sure that your equipment is of decent quality and that it is sanitary. Sanitation isn’t as big of an issue when you’re using disposable parts. If you buy metal autoclave grips, though, cleaning and sterilizing them between uses is absolutely necessary. You don’t want to be seen as a liability if someone’s body art gets infected. Whether you’re using an autoclave or disposable setup, also make sure that you’re wearing disposable gloves. This will limit your contact with bloodborne pathogens of the client. Keeping the right safety equipment on hand will protect clients from injury and will protect you from lawsuits. That's our round-up and reviews done of the best grips for tattooing. We spent alot of time going through customer and user reviews to come up with our top 5 picks. Each one that we have picked is great for gripping when inking, so be sure to check out which one suits your style best. 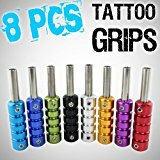 Hopefully, you can now have that peace of mind that your new tube grippers will not let you down during your next tattoo session!